We were greeted by a wonderful day and a completely quiet sea. The stronger force of the sun was already noticeable. In the morning we viewed the landside mountains with Monte Movar at Rogoznica: around 9 o’clock we were passing between Lissa and Busi and saw the little island of Pelagosa in the distance: a few hours later the high mountains of Bocche di Cattaro appeared. Barely visible with the eyes, a sailing warship appeared on the horizon which we thought might be one of our winter squadron, either “Nautilus” or “Albatros”. In the morning a battle stations exercise was completed for all hands. The guns were also maneuvered. Exercises our navy completed with its own special precision. During the journey the Italian coast became visible above the tender blueish contours of the sea. After a wonderful sunset we were regaled by a clear starry sky, a spectacle we enjoyed to the fullest on the afterdeck to the music of our felicitous band. 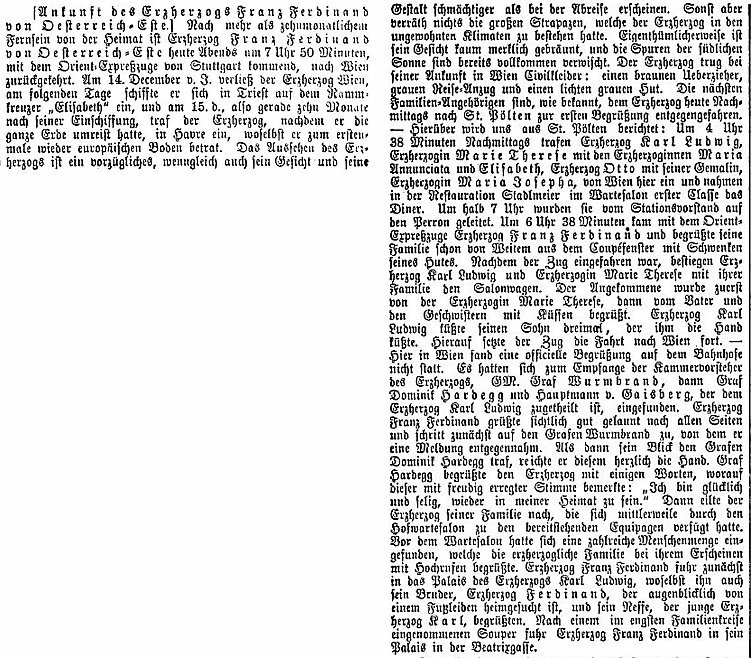 ANNO – on 16.12.1892 in Austria’s newspapers. The Neue Freie Presse informs its readers about the riches of fertile Africa. A German expedition of 120 persons marched 3000 kilometers from Cameroon to Chad. It also notes that Maria Antonia, widowed Grand Duchess of Tuscany, arrived from Gmunden for her winter stay in Abbazia. Meanwhile, 360 persons of Steyr, on their own will as duly remarked by the paper, departed to Genoa for their emigration to Rio Grande do Sul, Brasil. Emigration fever is spreading. Vienna’s K.k. Burgtheater offered a comedy by Gustav Freytag, „Die Journalisten“ (The Journalists). The K.k. Hof-Operntheater played Giuseppe Verdi’s „Un ballo in maschera“ (Ein Maskenball). Dieser Beitrag wurde am 16. December 2018 von wordpressadmin in diary veröffentlicht. Schlagworte: December, Mediterranean Sea, on ship. Vienna’s sea of houses disappear on the horizon: a last salute to the beautiful city – only after a long journey around the earth will I see her again! My parents, my younger sisters, Otto and my sister-in-law accompanied me to Trieste. On 14th December we arrived there in the evening. Just after my arrival, I embarked upon the ram cruiser “Elisabeth” where I was welcomed on board by its commander, Captain of the Line v. Becker and his staff. Not far from “Elisabeth” lay moored “Greif”. My parents and my sisters passed the night on board of that ship. Today in the morning my family – Ferdinand had also arrived – came on board of “Elisabeth” to while away the last hours before my departure. After the belated arrival of Admiral Baron Sterneck and finally of Count and Countess Thun as well as Prince Starhemberg a thorough visit of the ship in all its parts and all its equipment for the long voyage was undertaken. The batteries, the torpedo installations, the colossal machines of 9000 horse powers, the giant 24 cm tower guns, the officers’ mess as well as the magazines with the munitions and supply depots were duly admired. The last hours together with my family passed away all too quickly and now it was time to separate! To the salute of the guns and cries of “Hurrah” I accompanied my parents and siblings back on board of “Greif”, took my leave with a heavy heart and returned to “Elisabeth”. At 2 o’clock the ship was unmoored; the anthem was sung, a hundred times the officers and sailors shouted “Hurrah” – majestically, “Elisabeth” went into action. We drove past “Greif” and two Lloyd steamships “Arciduchessa Carlotta” and „Danubio“ packed tightly with ladies, officers and gentlemen. On all ships, the people’s hymn rang out; kerchiefs, caps and hats were swung as greetings. In a plethora of languages they shouted to us “Farewell” and “happy voyage” which were answered with “Hurrahs” and a flag salute. It was a touching moment! The tender ship „Büffel“, the two Lloyd steamboats and „Greif“ went along with us. Our two ship bands added patriotic color to the air of departure – the sounds of the Radetzky march and Prince Eugene march, the glorious “O you my Austria” (O, du mein Österreich) were drifting across the sea. Home seemed to want to imprint itself as a beautiful image into my memory, as the sun was beaming out of a clear sky, reflected in the deep blue fair Adria and from afar, the snow covered mountains were offering their salutes with their glistering peaks. But the separation has to happen at last! A few miles out of Trieste, level with Piran, “Greif” signaled on the mast top “Good journey, good bye and good hunting”, then it turned about sharply to starboard; a final salute from the bridge and we were on our own on a southern course into space. For a long time, I was observing “Greif”. The distance kept growing, the homeward bound ship grew smaller and smaller till it was but a point swimming on the horizon where the blue sky and the water seemed to flow together. Then it disappeared from my view. In my thoughts a feeling of eternal longing for my home and my dearest welled up, it was homesickness which I didn’t know before. Just a moment ago, it was wanderlust that had capture me with all its magic and now, only a few moments after the separation from my country, my parents and my siblings, it was homesickness that constant fellow of the home centered traveler which appeared unexpectedly out of the thought that I would be living abroad for a year. Never did I experience the power more strongly that a nation can hold over its sons than when I was leaving it behind with every second. The thought comforted me that distance does not equal separation. Hope about a fortuitous return home was building a bridge to a joyful reunion. Willingly, I humored my mood and lost myself in the thoughts that had triggered it for a few moments. Then I banned them. It was expedient for everyone to make one’s stay on this floating piece of home as comfortable as possible. In the cabins, photographs and pictures were hanged, the books of the large travel library sorted, weapons unpacked and checked. Soon the work was completed and I went again on deck. The well-known coast of Istria with its spare rocks and the nice white hamlets was passing by: from afar, the peaks of Monte Maggiore were glistening. A glorious sunset completed the day. In the evening, we met in the lunch room, and the approaching night met us writing the first letters home. ANNO – on 15.12.1892 in Austria’s newspapers: The morning edition of the Neue Freie Presse opens with a report on the German Reichstag discussing contentious military issues. In Vienna, too budgets are discussed in parliament. Vienna’s K.k. Burgtheater announced Ludwig Fulda’s new play „Das verlorene Paradies“ (Lost Paradise), while the K.k. Hof-Operntheater played Richard Wagner’s Tristan und Isolde. Scharf’s diamond imitations, of world renown. Christmas presents for travelers by Herman Waizner, 1. Vienna. Dieser Beitrag wurde am 15. December 2018 von wordpressadmin in diary veröffentlicht. Schlagworte: December, Mediterranean Sea, on ship, Trieste. In Stuttgart was finally realized what I had dreamed about in the hunting camp at Tandur1 to hold my sister in the arms as a new wife in her freshly constituted home. But understandably I wanted to return home and thus the next day I rushed on home. When the train reached the marking of the black and yellow boundary posts at Braunau and knew to be once again in Austria, my heart was filled with joy that increased all the more the closer the Orient Express approached, flying through the well known beautiful regions of Upper and Lower Austria, to the heart of the homeland. In St. Pölten I celebrated a happy reunion with my parents and siblings and arrived in their company in Vienna at last. Safe and secure I returned home after a long voyage around the world. Thankful to providence in my heart, I saluted again after a year’s time — the old eternally young Imperial city. Location: Stuttgart, Germany and on 18 October, Vienna, Austria. ANNO – on 17.10.1893 in Austria’s newspapers. The k.u.k. Hof-Burgtheater is playing the comedy „Ein Nachtlager Corvins“. The k.u.k. Hof-Operntheater is performing „A Santa Lucia“ and the ballet „Die verwandelte Katze“. The Neue Freie Presse reports that Franz Ferdinand did not meet anyone in Paris and stayed in the Grand Hôtel under the incognito of Count Wartholz. Neue Freie Presse reported that Franz Ferdinand visited the Eiffel tower and stayed at the Grand Hôtel in Paris. Neue Freie Presse, 18 October 1893, reports about Franz Ferdinand’s reunion with his family at St. Pölten. He apparently has lost weight – lankier („schmächtig“) is not a favorable descriptor. Dieser Beitrag wurde am 17. October 2018 von wordpressadmin in diary veröffentlicht. Schlagworte: October, Stuttgart, train, Vienna. The fog that had been pursuing us on the Atlantic Ocean still had an obnoxious consequence in Paris, as the „Bretagne“ failed to keep to its time table so that we were unable to make it into yesterday’s Orient Express. He thus had to accept the inescapable fate and stayed in Babylon on the Seine, whose charms known to me were not captivating me this time. In the evening we were to depart towards Stuttgart. In Paris too the preparations for the reception of the Russian officers were in full swing everywhere. A hasty tour of the city to revive some memories was concluded with visits to the Louvre and the Morgue, the ascent of the Eiffel tower, a breakfast at Bignon’s and a drive through the Champs-Elysées and the Bois de Boulogne — that is the most that is possible in such a time frame. ANNO – on 16.10.1893 in Austria’s newspapers. The k.u.k. Hof-Burgtheater is playing the comedy „Bürgerlich und romantisch“. The k.u.k. Hof-Operntheater is performing the opera „Margarethe (Faust)“. The planned arrival of Franz Ferdinand by train is reported in the Neue Freie Presse. 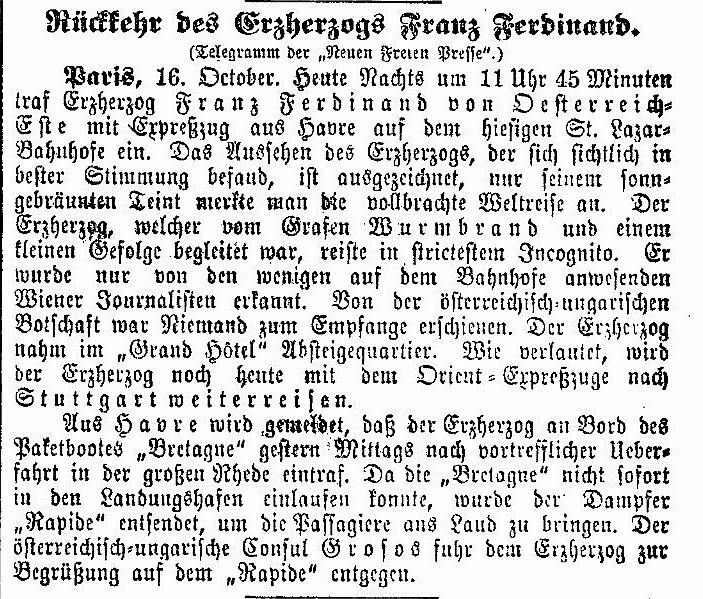 Franz Ferdinand’s arrival in Le Havre and Paris is reported in the Neue Freie Presse, 16 October 1893, p. 5. Dieser Beitrag wurde am 16. October 2018 von wordpressadmin in diary veröffentlicht. Schlagworte: France, October, Paris, sightseeing. We steered into the channel and again in the thickest fog but — „a good ship in its dark yearnings is well aware about the right way“1, so that „Bretagne“ managed to find her wet path and, using the steam whistle almost continuously, advanced without danger past the numerous approaching vehicles of all types crossing her route. Among them was also her sister ship that had set course for New York and passed „Bretagne“ very closely. Finally, finally — it had become lighter around the ship — in the distance appeared a white strip out of the ocean — „Land, land!“ we said to ourselves. The coast of France stopped the ocean waves and Havre welcomes the newly arrived in a friendly manner. At 3 o’clock in the afternoon the anchor was dropped and shortly afterwards we stood on solid ground, European ground. One has to have travelled around the world for nearly a year to appreciate the joy that filled me at that moment. The city was already dressed in festive bunting in honor of the officers of the Russian fleet that was anchoring at Toulon. The foreign sailors were excepted to arrive in Havre from Paris as the guests of France. Soon after the arrival we undertook a drive towards Trouville in the company of our consul Grosos and attended a dinner in the evening in Grosos‘ hospitable house whose wife gave us the honor in the most kind manner. From Havre we went to Paris. ANNO – on 15.10.1893 in Austria’s newspapers. The k.u.k. Hof-Burgtheater is playing the drama „König Richard II“ in the afternoon and the comedy „Die kluge Käthe“ in the evening. The k.u.k. Hof-Operntheater is performing the opera „Die Rantzau“. Dieser Beitrag wurde am 15. October 2018 von wordpressadmin in diary veröffentlicht. Schlagworte: France, Havre, October, sightseeing.